Today UK celebrates its Mother’s Day. Kenya and India celebrate the US one. I get to know Mother’s Day in UK is approaching when my sister and cousins post it on Facebook. That’s the time I would call to wish my mum and then again ,when we celebrate in May. Though I tried explaining to her why I wished her in May she never quite got it. For her Mother’s Day was just a couple of weeks before Easter and when she would get flowers, chocolates and gifts from my sister, brothers and sister in laws. This recipe is for my mum. She loved khandvi and finally I have got the hang of spreading the batter pretty evenly before it turns into a cold mass of sticky dough. My dad use to stop at one of the Indian sweet shops in Queensbury, to buy the yummy khandvi for her efore taking her to the hospital for dialysis. Khandvi requires a lot of patience. Try the recipe when you are not in a hurry to complete other chores. 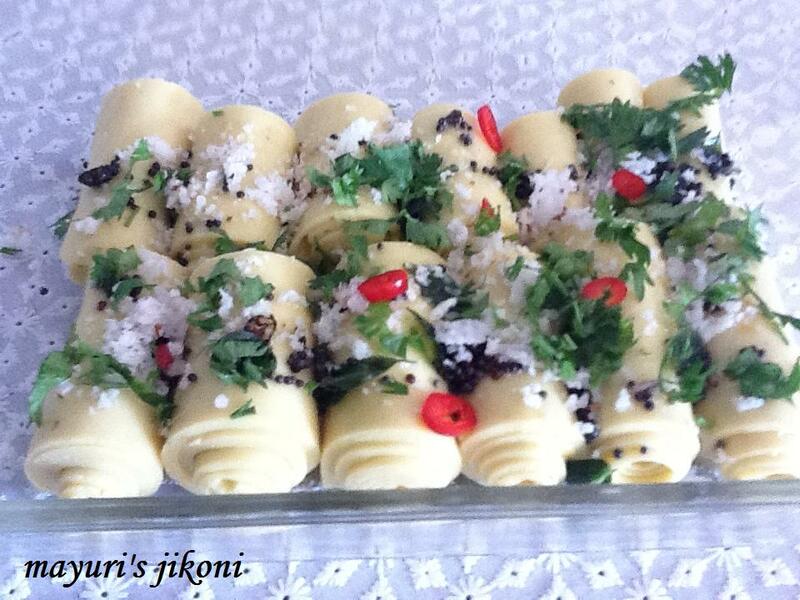 Now I can’t wait for the kids to come home so I can make khandvi again as they too just love it. Grease 2 baking sheets or steel plates with oil and keep it ready. Place all the ingredients for the khandvi in a deep pan. Whisk it with a hand blender. Place the pan over low heat and constantly stir the mixture to avoid any lumps from forming. You will need to cook the mixture and stir it frequently for 10 minutes. Take a small blob of the paste and try and spread it at the corner of one of the trays using a spoon. If it spreads easily and you can roll it up, the mixture is ready. If not then cook it further for 5 minutes. Take half of the mixture and place is along the edge of the tray. Place the pan on the heat again. Take a flat spatula ( the one we use for parathas)and spread out the mixture horizontally or vertically. Be quick. Take the remaining paste and repeat the procedure using the other tray. Let the spread out mixture cool. In the meantime, prepare the tempering. Heat the oil in a small pan over low heat. When it gets hot, add mustard seeds. When it begins to splutter, add the remaining ingredients.Stir fry the mixture for a few seconds and take it off the heat. Cut the spread out mixture into an inch in width strips. Roll up each strip like a swiss roll, gently. Place the rolled up khandvi in a serving plate. Repeat step 15 and 16 with the remaining strips. Pour the tempered mixture over the khandvi and serve. Gather up the paste into a big lump.Place your mixing spoon in the middle of the paste. If it falls down, the mixture is not ready. When you spread the mixture on the 1st tray, return the pan onto the low heat. If the paste becomes cold, it will not spread. If you want to roll smaller khandvis, then cut each strip into half before rolling. Grease the trays sparingly. Too much oil will result in the batter coming back onto the spatula when you try to spread it. Try half the recipe first. If it does not spread evenly, do not throw the paste away. Just chop the cooled paste finely, add the tempering as it still tastes good. Place a kitchen towel under the tray so it does not slip while you spread the paste.